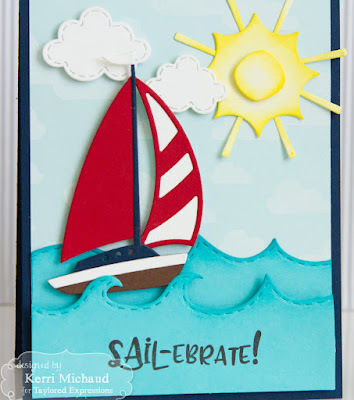 Taylored Expressions June Sneak Peeks: Sail-ebrate! Hello! It's Day 1 of June Sneak Peeks from Taylored Expressions, and all of the new products will be available on Thursday, June 8th at 7AM PDT! 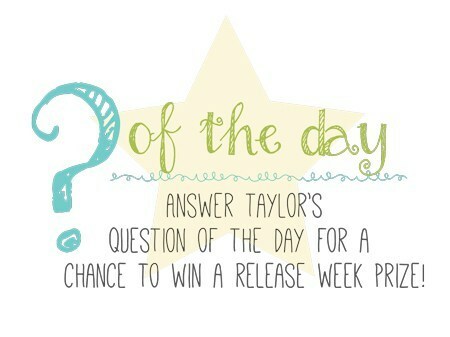 I just LOVE this release, and being a Floridian, most of the products remind me of home! For my first card I used the super fun new On the Water-Sailboat Dies to create this adorable sailboat! I pieced it together using Cherry Pop, Blue Corn, Sugar Cube, and Chocolate Truffle cs. 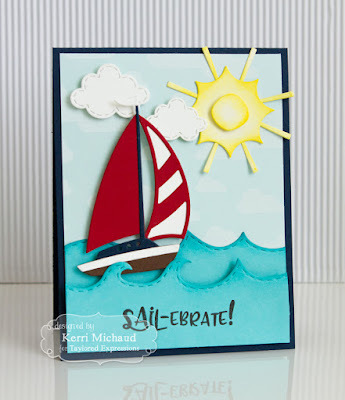 I then built my scene by stamping a piece of Salt Water Taffy cs with the Cloud 9 Background Stamp and some Sugar Cube Ink. I added the water that I cut with the Build a Scene Rolling Waves Dies and some Cookie Monster cs, the clouds cut with the Stitched Cloud Duo Dies, and the sun cut with the Build a Scene Sunshine Dies, some Buttercream Frosting cs, and sponged with Lemon Meringue Ink. 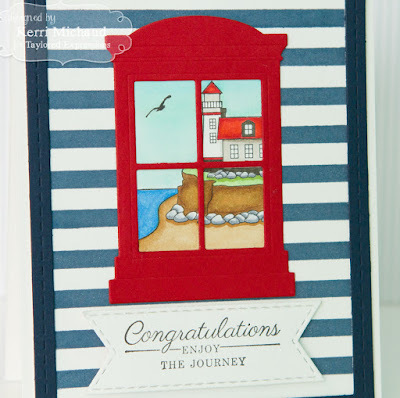 To finish it off, I stamped the sentiment from the new Seas the Day Stamp Set with Oreo Ink directly onto my wave:) So cute! I used the Striped Background Stamp to stamp a piece of Sugar Cube cs with Blue Corn Ink. 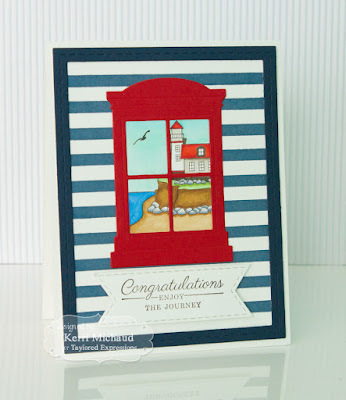 I then used the From My Window Stamp set to stamp the lighthouse image with Oreo Ink and color with Copic Markers. 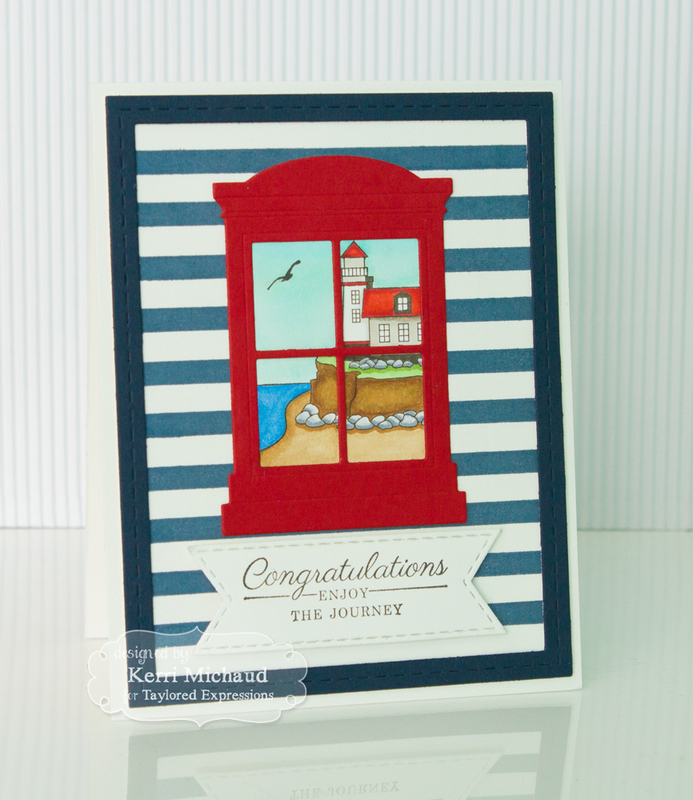 I cut it out and layered it under a window cut with the Arched Window Die out of Cherry Pop cs. I added the sentiment from the From My Window Stamp Set, stamped with Oreo Ink and cut out with a Stitched Banner Stacklets Die. Finally, I framed the card front using a Stitched Frame Stacklets Die and some Blue Corn cs. card has lots of movement.